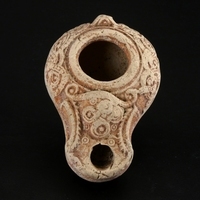 Roman figurative terracotta oil lamp. The discus is framed by raised concentric rings, in the centre a depiction of a lion. The triangular nozzle is decorated with two volutes. Surface hairline above the lion, otherwise in excellent condition.